Vivian Keith Gray was born in Kingston, Jamaica on February 19, 1988 to Junior Gray and Glennette Shaw Brown. He came to America at a young age and worked for the Publix Corporation for several years. He enjoyed his life and was an extremely powerful songwriter and producer. He cherished his family and was always greeting all with a pleasant smile. He was stranger to no one. Vivian Keith was known as Massup Di General. 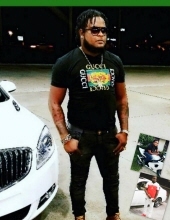 Vivian Keith Gray is survived by his wife, Towanna Newman Gray, son, Kaiden Gray, Mother, Glennette Shaw Brown, Father, Junior Gray; nephews, aunts, grand aunt, grandmother, other relatives and dear friends. To send flowers or a remembrance gift to the family of Vivian Keith Gray, please visit our Tribute Store. "Email Address" would like to share the life celebration of Vivian Keith Gray. Click on the "link" to go to share a favorite memory or leave a condolence message for the family.